Allocating instruments to tracks is as simple as dragging them onto the familiar-looking Session View. 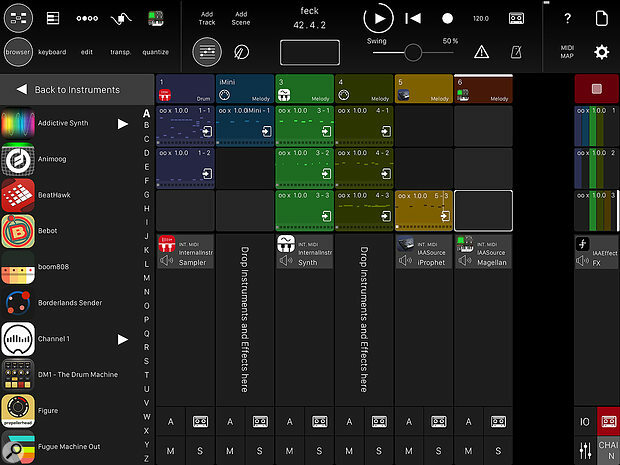 Modstep is an ambitious iOS sequencer for MIDI synths, whether they’re physical hardware or other apps on your iPad. From the outset, there’s a sense that the best philosophies of existing sequencers have been absorbed and applied, with unnecessary limitations kept firmly at bay. Thus, you can add as many tracks as you like, create as many clips and scenes as you like, and build long insert effect chains for the internal synths without being restricted to an absolute number of slots. Typically, any limits that do exist are imposed by your iPad’s CPU or RAM, or by the underlying technology, eg. Inter-App Audio permits just a single instance of any particular IAA app. However, with the introduction of Audio Units in iOS 9, even this could become a thing of the past. Modstep provides AU support already, although I didn’t have any examples to try out. You should be running at least iOS 8, as this is required for the internal sampler and Ableton Link. Having mentioned the ‘A’ word, I think it’s fair comment that Ableton’s influence is widely felt: in the terminology, the look and in the ‘jam freely with clips and patterns’ vibe. Essentially, you don’t have to stop the music, even when loading new samples or copying clips or scenes. Having allocated a few tracks in the Live-like Session View, you can plunge right in by assigning them to either the built-in synth or sampler. If you prefer to work with familiar instruments from your collection, this requires a simple drag and drop operation from the browser. Alternatively, by clicking the ‘IO’ button, you can access the MIDI I/O for each track and thereby address external instruments by port and channel. Then, having armed a track for recording, you can simply start playing, either from a MIDI controller, or the built-in keyboard or pads. Naturally, quantisation is offered either pre- or post-recording. The Session View offers a graphical overview of clips, arranged in vertical tracks. A right-hand column provides a series of scenes — collections of clips. As you’d probably imagine, a clip is a chunk of MIDI data — notes and CCs — to be sent to the chosen instrument. Each clip contains up to 16 patterns (of up to 16 steps) and these can be freely selected and repeated via the handy pattern matrix, available from the step-sequencer page. The matrix is a pretty sweet implementation and in it any combination of patterns can be set to play with a few gestures, making this a potentially powerful live sequencer. Indeed, Modstep only lacks a Song Mode to earn full marks. For the time being you’re given an audio recorder that will neatly capture the output of a complete performance or individual tracks if you fancy exporting them for treatment in your DAW. Thanks to the amount crammed into each screen, it could take a day or so to fully absorb everything on offer. After that you’ll really appreciate the layout and speed of access. From icons in the top left-hand corner, you can slip into to the Session View, the piano-roll editor, the step sequencer, the template editor and the detailed instrument view. Practically every time I thought ‘I wish it could do...’ or ‘I wonder if it can...’, it took just a glance — usually in the most obvious place — to realise my desires had already been granted. When it comes to MIDI modulation, any track can accommodate up to 128 parameters. A series of MIDI templates are included for a range of popular synths, their MIDI CCs named and ready to serve. Via the twin XY pads you can record live tweaks of these parameters, making adjustments later in the piano-roll editor if necessary. If your synth isn’t featured, it’s a fairly easy matter to create a new template, either by importing a CC list or by creating one from scratch. The editor includes the ability to draw in controller automation based on names extracted from the MIDI template library. While it’s great to be able to work with your favourite synth apps and effects, the internal synth and sample player are both pretty serviceable, and have the advantage that both can be used multiple times. The sampler offers 16 pads of mapped samples, ideal for drum kits, sound effects and the like. Example kits are provided and each can be treated to an effect chain consisting of a multi-mode filter, reverb and delay. Samples are subject to the usual tweaking of length, pitch, envelope, etc, and while you can’t sample directly in this version, you can import or copy, via the usual methods, up to a maximum of 30 seconds per sample. The synth’s engine is an additive oscillator with up to 64 harmonics, and there’s an LFO and pitch envelope joining the filter, delay and reverb. Modstep even manages to make high-end DAWs like Logic look weak in certain areas, notably its handling of scales. Not only can you record in one of the 25 provided scales, but you can apply them to individual tracks or entire scenes retrospectively if you wish. This is just one of many examples of how this slickly-designed, comprehensive app pushes the limits of what can be expected from sticky fingers on glass. I was most impressed by the ease with which Modstep juggled varying combinations of IAA instruments and effects on my iPad Air, in parallel with MIDI hardware. CoreMIDI and all popular interfaces are supported, which suggests something I’d never considered before: putting an iPad at the heart of a live sequencing rig. Several features I’d planned to highlight as missing (eg. tempo and scale per scene, MIDI file import) arrived in the 1.1 update, leaving only a song mode as a noteworthy absentee. Personally I wouldn’t let that dampen my enthusiasm, especially given the rate of advance so far. 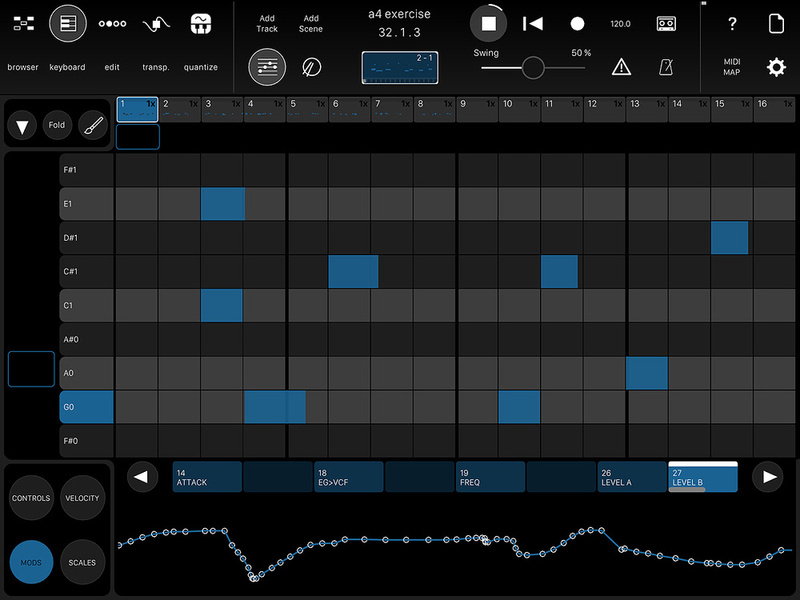 If you’re looking for a versatile, adaptable MIDI sequencer for iOS, Modstep comes highly recommended.